The Cirque Plume, La Villette, tel. 01.40.03.75.75 ; Thurs - Sat. 20.30, Sun 15.00 ; until 29 December. They roll on in single file, miner’s lamps on their foreheads, clumsy and lumpish as if embarrassed by their rather imposing musical instruments. And into it all, on the graceful swing of a trapeze, comes a ravishing contortionist to perturb and fascinate this virile band. For the spectators - old and young alike - eager for fun and thrills, this is the beginning of a fantastic journey. You will leave with your head reeling under an avalanche of images from the new Cirque Plume creation and heartened by such a display of originality. The keen hall-mark of Bernard Kudlak, the master worker, is there, more inventive than ever, dosing emotional effects in a rising crescendo of successive tableaux. The Cirque Plume has come a long way in twelve years. Originally from Besançon, the juggler, Bernard Kudlak took to the road with a brass band one fine day in 1984, drawing in his wake a merry bunch of acrobats and trapeze artists It has taken just four shows, each played to the point of wanting a change - the previous one "Toiles" (1993) played to 265,000 delighted spectators in 350 performances -, for the Cirque Plume to build up a solid reputation in both France and Europe.  At the moment they are at La Villette - a must for all amateurs of the genre - with some new faces, for L’harmonie est-elle municipale ?, their latest creation which plays on the duality of the sexes, on attraction and the swapping of roles. This theme which ties it all loosely together makes it possible to jump from one varied, screamingly funny number to another. Among the most amazing we should mention Jacques Schneider, the crazy cyclist with his bushy beard, dishevelled mop of hair and staring eyes - a mutant on a bike - he dribbles, shoots climbs and juggles like nobody’s business. The star act, which raises the roof is his number on the trampoline. In quite another vein, the English woman Rachel Ponsonby, is also well worth seeing, a one-woman-band, she renders, with brio, a piece for flute, with two instruments in her mouth, another two up her nose, all the while beating time with her knees. Running around on their hands, rolling upside down from one side of the stage to the other, balancing on a sole finger, such are the other facettes of these practiced performers, musicians all, playing the compositions of Robert Miny, the company’s own composer. However, the show can be reduced neither to a simple sporting exploit nor to the subtle work of illusion. Transformations, metamorphoses, the play of light and shadow, the fourth dimension and surprise effects are certainly guaranteed. But the palette of circus acts is widened with puppetry, for instance, as in the duel with Brigitte Sepaser, the tight rope walker. Above all, the unity of the main theme, the stronger and stronger accent on comedy, the increased number of sketches and the "in-humour" are evidence of the will to send traditional definitions flying. Having reached maturity, the ever more successful Cirque Plume has not finished giving us something to talk about.